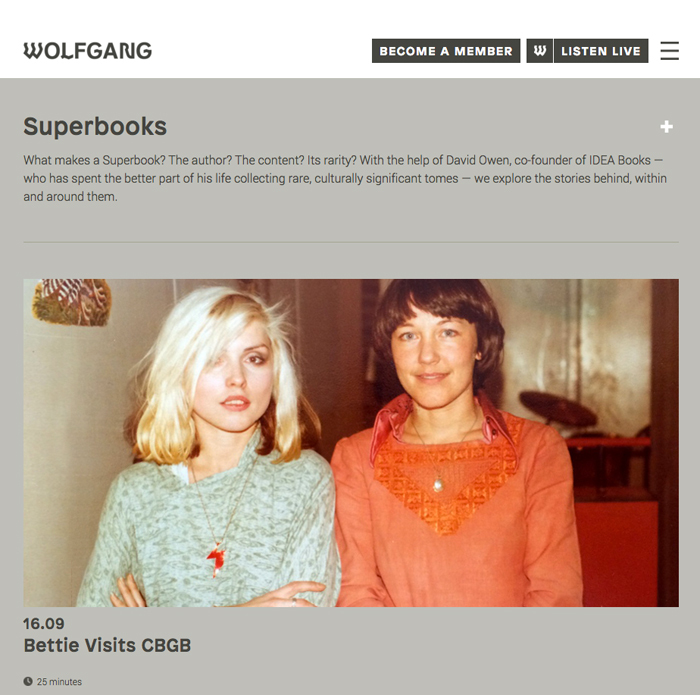 David Owen, the co-founder of London vintage booksellers IDEA Books Ltd, has chosen Marc H. Miller and Bettie Ringma’s “Bettie Visits CBGB” as what he calls a “Superbook”: a rare work of exceptional cultural significance. Owen makes his point in an entertaining and evocative radio program just released by Radio Wolfgang. A sound collage that mixes interviews with music, the program evokes the Bowery (then a notorious skid row) and the glory years of the rock club CBGB, using as its centerpiece this collection of 10 color snapshots in a handmade leatherette portfolio. The photographs in “Bettie Visits CBGB” show a young Dutch woman posing with Patti Smith, Blondie, the Ramones, Talking Heads, Richard Hell and other musicians on the brink of stardom. Marc H. Miller, one of the creators of the portfolio, is founder of the website 98 Bowery and the related Gallery 98. To see pictures from the “Bettie Visits CBGB” series, click here. The radio program can be accessed on the website of Radio Wolfgang.